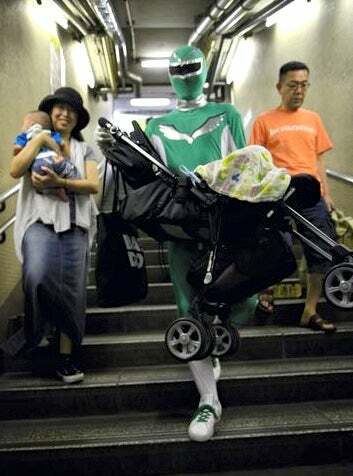 In a green outfit with silver trim and matching mask, a superhero waits by the stairs of a Tokyo subway station, lending his strength to the elderly, passengers lugging heavy packages and mothers with baby strollers. "Japanese people find it hard to accept help, they feel obligated to the other person, so the mask really helps me out," said Tadahiro Kanemasu. Nice to see at least one of the Power Rangers is finally doing some good.